Between the comforts of SoundGuard rooms and convenience of free Wi-Fi and complimentary hot breakfasts our guests might find AmericInn of Jackson the right place to rest their weary heads. 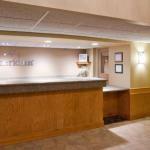 This two-story lodging offers 52 tasteful non-smoking and smoking rooms that are equipped with free Wi-Fi. Options include one- and two-room suites with bedrooms set off by French doors and sofa beds for late sleepers in the group. AmericInn love getting the word out about its SoundGuard solid masonry construction which makes for quieter rooms. After a sound night's sleep guests can get going at the complimentary breakfast featuring Belgian waffles biscuits and sausage gravy eggs fresh fruit and pastries. After a day of work or play guests have plenty of opportunity to unwind either by downing pizza and beer at the on-site pub or dipping into the heated indoor pool and hot tub. Practical perks include a business center and outdoor parking. Right off I-90 the hotel makes for easy escapes and local exploration. Fort Belmont â?? a tribute to pioneer life complete with a stockade farmhouse blacksmithy and gift shop â?? is one mile away. Those revved up for faster-paced draws enjoy sprint and stock car racing at Jackson Speedway within two miles. Rochester International Airport is less than 140 miles away and Minneapolis-St. Paul International Airport is just over 150 miles.